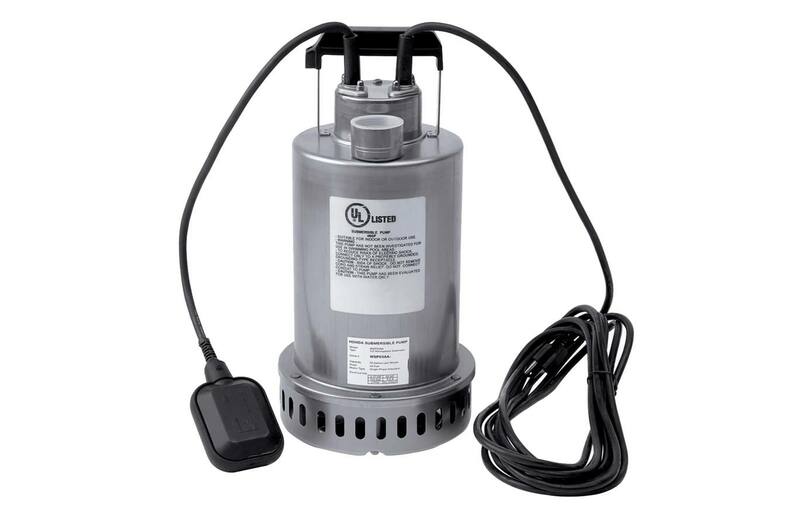 1/2 hp, 115V submersible pump: 115 Volt operation allows the pump to be plugged into a standard outlet. (GFCI is recommended). Rated for continuous use: Operates on continuous duty in temperatures of up to 104°, and intermittent duty up to 140°. Since this pump can be used 7 days a week, 24 hours a day, it is suitable for any application that needs to move water from one place to another on a continuous basis. Solids handling up to 3/8": Move slurry and dirty liquids without the worry of damaging the pump. Lightweight durable stainless steel casing: The pump won't rust or corrode, minimizing costly repairs and replacement. The 304 stainless steel is an industrial grade, again minimizing damage and reducing the need for repairs. Automatic non-mercury float switch: Honda submersible pumps use a mechanical float switch instead of mercury, eliminating the use of hazardous materials in the pump. Built in thermal reset switch: If the pump overheats, it automatically resets itself after the pump cools down. This is designed to protect the motor from periodic overheating. Top discharge: Great for applications where space is tight. Operates fully or partially submerged: No need to worry about the water level for the pump! Shielded ball bearings for added durability: Shielded ball bearings, both top and bottom, add significantly to the longevity of the pump. Oil lubricated double mechanical seals: Oil lubricated double mechanical seals prevents damage to the seal if the pump is run dry. Dimensions (WxH): 8.3 in. x 17.2 in.